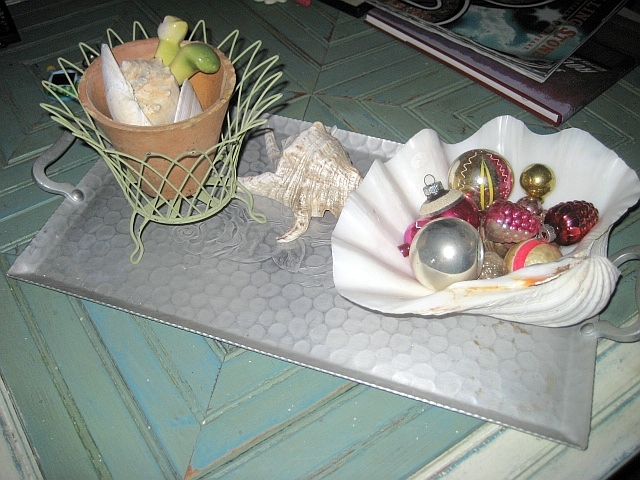 She sells seashells by the seashore, she buys seashells by the seashore, she collects seashells by the seashore! Cheryl at Stash Studios is having a giveaway and she is seeking comments about what inspires you. Since moving back to the Virginia coast I can’t get enough of seashells. I collect on the beach, I collect while kyaking, I hunt for them at the thrift stores, yard sales and estate sales. Living on the coast ensures that every estate and yard sale is good hunting ground for shells. 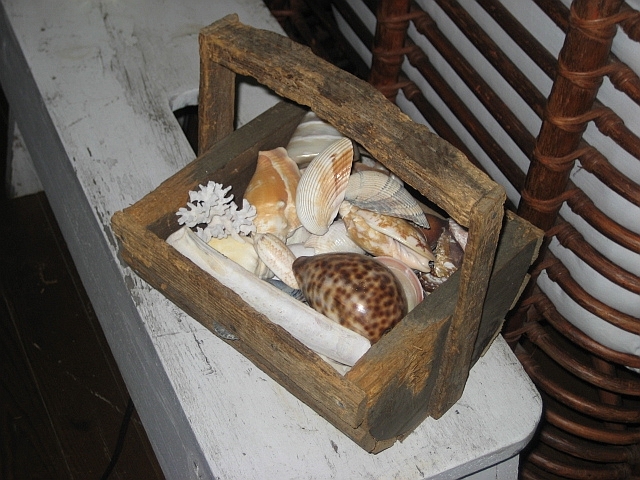 I found this crusty handmade basket from driftwood filled with shells at an estate sale out in Grafton. The house was a 70’s modern design, right on the water. Susan over at T-Party wrote about her collection of McCoy and USA planters and how she doesn’t "plant" them but uses them for all sorts of other purposes. I love that! I like to plant mine sometimes, but I also like to fill them with seashells. Another of my collectibles that is always on my radar is old silverplate. I love that patina of tarnished silver. 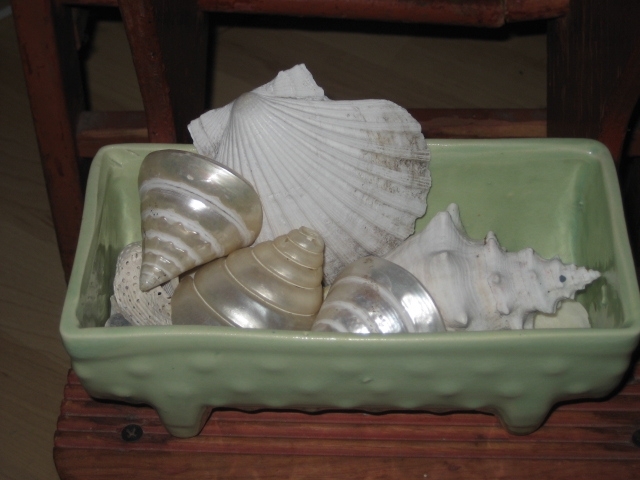 Goes quite well with seashells and seaglass. I love BIG shells, I never pass up a giant conch shell. In fact found one at the thrift today for $3! ONE DAY I hope to find a GIANT clam shell! You know, the size of a sink! I recently found one at a consignment store in Salem, VA on one of my business travels. It is quite large, about 13 inches across and it was a steal at $20. Of course the women minding the store had to tell me the story about the GIANT one, (she held out her arms like she was holding a pig) that came into the store and it wouldn’t sell. They finally sold it for $50!! Now why, why did she have to share that with me! 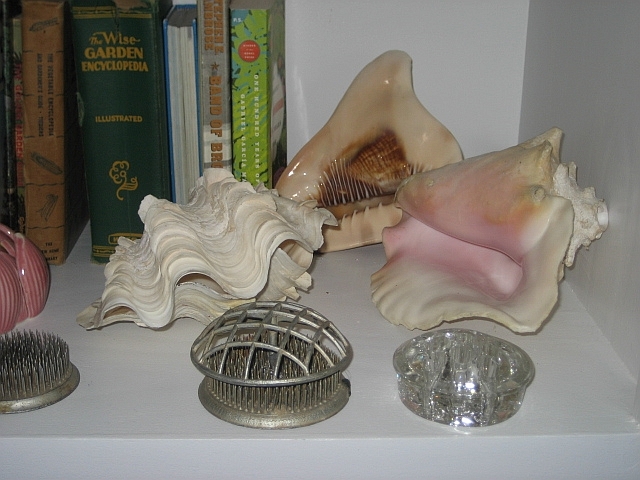 My BIG, but not GIANT, clam shell is filled with vintage christmas ornaments, one of my top three collections. 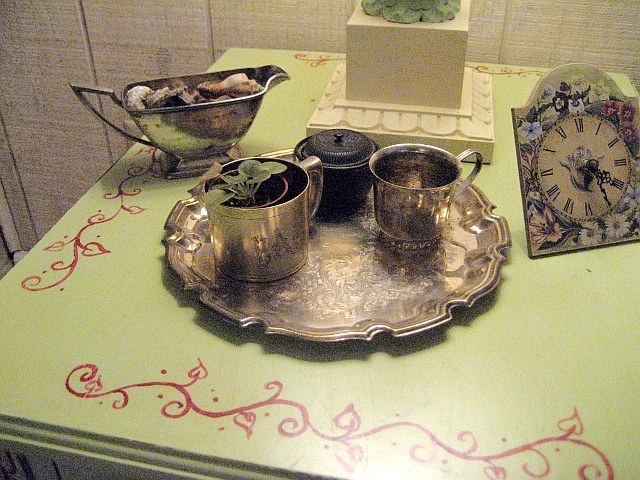 See here a glimpse of the vintage frog collection, (that could be another blog all by itself!). I couldn’t believe it! I just finished writing a blog about collecting, and thought I would check and see what you were thinking and, well, we were thinking about the same thing. 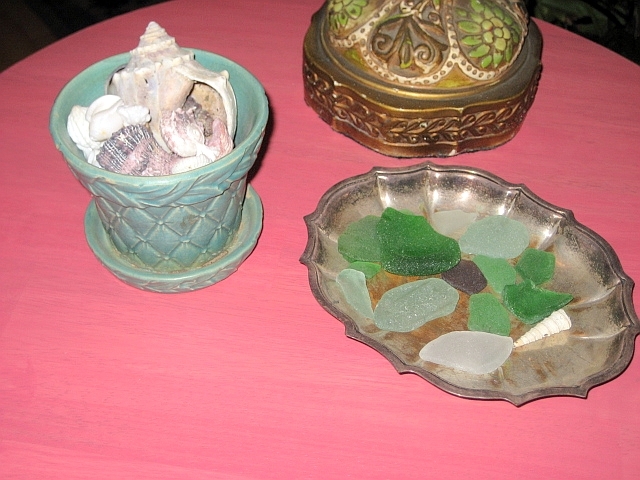 AND, I forgot that I also love and collect sea shells and sea glass. Suzy your collections are DIVINE!!!!! What total eye candy…. 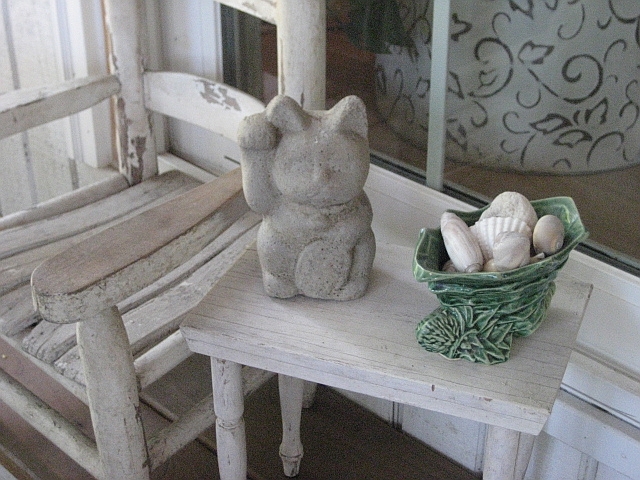 Oooh – I just started collecting antique frogs too. I have 6 of the spikey ones – really old ones. Two are long rectangular ones which I especially like. I use them to hold cards and other bits of things that I want to look at for a while. How do you decide about the glass ones with the holes? I can never decide which ones are old or whether I really like them? what makes them special to you? Love the vintage Christmas stuff – another of my collections. I like the really faded pink and aqua ones best. 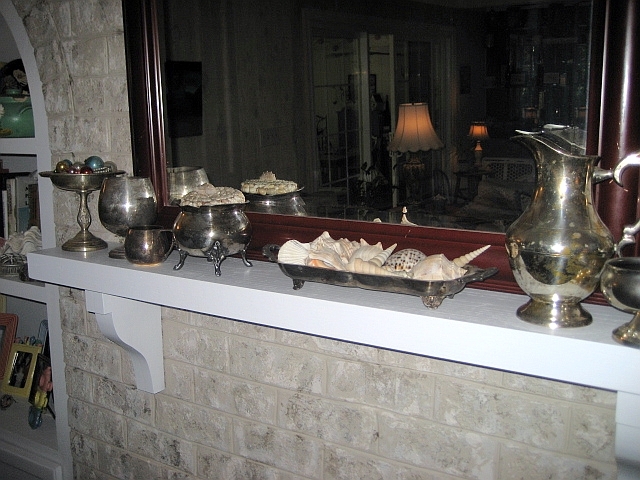 Shells – well, my house is always full of shells. I’ve lived in Florida almost all my life, so I’m sure some of them I’ve had for decades. Oooh! What great collections! Everything looks so pretty! You know I love the shells! Looks great! Check out the female bust on my blog! She is encrusted in shells! I sell shells at my little space down by the beach in San Diego! If you ever need a shell let me know!Have a Great Week!